finally.. after 10 months for around to assembling this door! We've been using the kids bath to shower and giving our toddler baths in our tub. It took 2-3 hours to install. we also had to order replacement parts for the top and bottom because when we attempted to cut it to size it was crooked.. and we're advid diyers. We took the replacement parts to a local shower and glass place to cut it for us. Completely worth the extra $40 they charged. Haven't showered yet in it but I think it'll be big enough for us. Who would call a shower door "elegant"? But yet, here it is. This is so sleek and gorgeous. I do wish the installation screws had cover caps inside the shower but oh well. The doors glide smoothly. The handles are a large size - everything about this is just nice. We've put Rain X on it so it will sheet water and not spot. The quality is good. Fit and finnish very good. There are a couple of small things that bothered me a bit. First of all, the installation instructions are not very good. If you're not saavy you may have some difficulty with the installation. Second, and the most annoying to me, is that the "screw covers" and "hole plugs" do not match the finish of the rest of the frame and hardware. I purchased brushed nickel and the covers were all bright shinny chrome! A very noticable difference! Other than those small things, so far I like the style and quality overall. 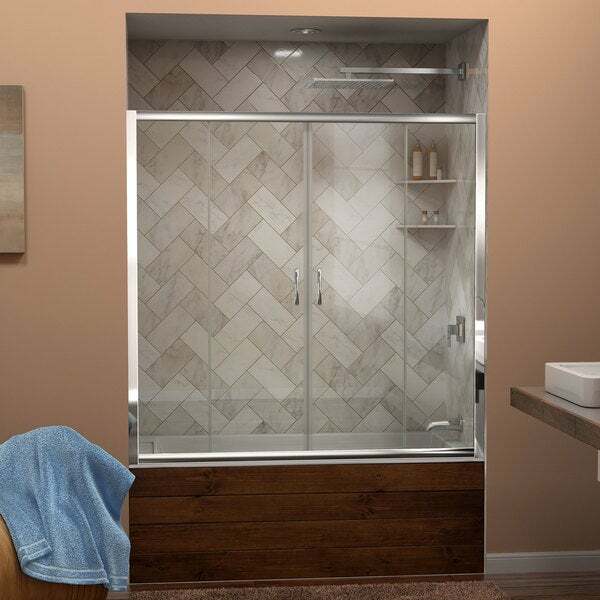 DreamLine provides an off-the-shelf shower unit with the look of a custom design. If you received the wrong decorative covers please contact the manufacturer for replacements. We take care to outline the step-by-step installation process in the manual as clearly as possible. If you are unsure of a procedure outlined in the installation manual please contact the manufacturers Support Department. This is such a solid tub door that really looks great in our newly remodeled bathroom. It certainly wasn't the cheapest option, but it is definitely worth the price we paid and I would choose the same item again. I'm please with this doors. I don't know why it's called frameless, but it looks very nice. One thing I had to do myself though, was removing the rubbers I was supposed to leave to avoid glass contact. That made it look bulkier. Excellent product DIY for the average home handyman Am now installing a single shower door. would recommend getting the 72" and adding tile if need; the 58" seems small on our tub, since our new home ceilings are high. product itself is decent, but the packaging was in terrible shape and even patched up with tape and another box. the styrofoam to protect it was broken and also all over the place. the install took my husband 4 hours or more; but 2nd one went up quicker since he knew what to do by then. This item is Great ! I needed very little assistence putting the frame together but once that was done [to long for one person] I finished the doors & installed them on the tracs in about an hour !! Great simple solution. Not only looks good, but also functions very well. Alittle confusing at first and took alittle longer than I thought it would but love the wayit looks and dresses up the bathroom. We just purchased our second unit for another shower. First one is holding up very well for past 4 years. Reasonably easy to install if you have power tools and are somewhat handy. "Does this come in thicker glass like 5/16 inches?" Unfortunately, the DreamLine Visions is only available in 1/4" thick tempered glass at this time. "How does the door open. Do both doors slide open?" Hello Newtb, yes, both doors slide to open. Sorry for the confusion. Thank you for shopping with us! "what is the height of the bottom track? It looks to be over 2 inches?" Hello tgweb, the height of the bottom rail is 1.75 inches. Thank you for shopping with us. "Is this product available with a taller glass? Instead of the 58 tall something more along the lines of 65 tall?" Hello tgweb, we do not have a higher glass door in this item. Thank you for checking with us. "If I am installing this in a 60 inch space and all glass panels are 12.5 inches won't that leave 10 inches of gap that water can escape?" I just saw on the last picture the sliding doors are 16 3/8 inches and not 12.5 like in the comment below. "Will this be able to fit a 57 3/4" gap? 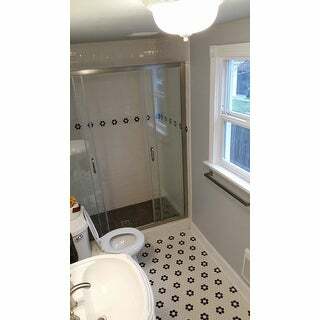 That is the width wall-to-wall around the tub in my bathroom." Nevermind! I just saw that it can fit a 56-60" area.